Mix tamari, orange juice, garlic, and honey in a shallow glass baking dish. Add salmon, turning to coat. Cover and refrigerate for 30 minutes, turning occasionally. 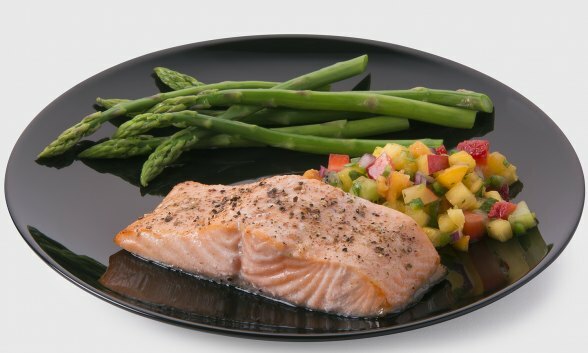 Remove salmon from marinade, discard marinade. Pat salmon dry. Rub both sides of each fillet with oil. Coat the flesh side of each fillet with pepper. Line AirDaddy® air fryer basket bottom with aluminum foil and place fillets, skin side down, on the foil. Cool at 350° until salmon flakes, about 15 minutes. Combine all ingredients in a medium bowl. Cover, let stand for 1 hour to blend flavors. Salsa can be made several hours in advance and refrigerated.